I have a confession to make – I have always been frustrated with the gap between 3-15x/4-16x scopes and 6-24x/5-25x scopes; I don’t feel the 3-15/4-16 provides quite enough top end for long range shooting (for me personally) and while the 6-24’s and 5-25’s provide enough top end, many come by sacrificing necessary FOV on the short end for close up shots. It’s baffled me why few manufacturer’s make 5-20/4-20 range scopes, but that is changing as we’ve seen more and more offerings filling this gap. 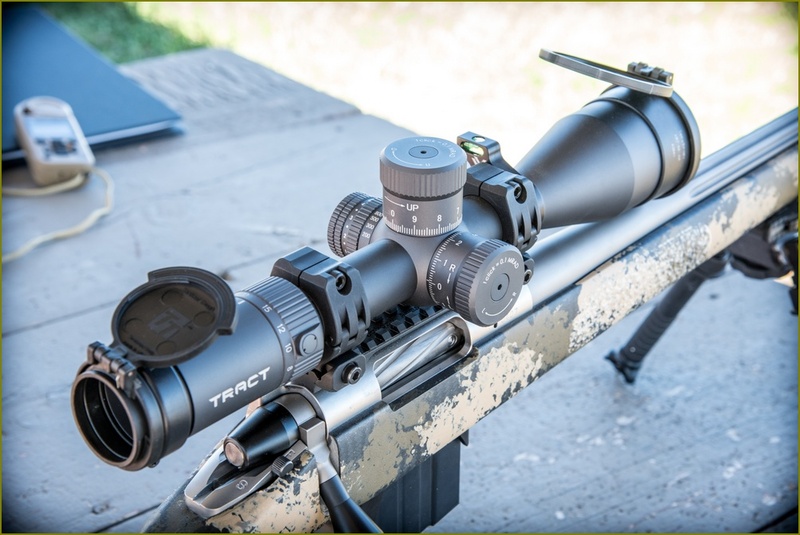 The name “Tract” may not be a household name among the sport optics industry as they are new to the scene and have mostly catered to the hunting arena thus far; however, in early 2018 the “new” Toric 4-20×50 FFP scope was introduced and that caught my attention for reasons which should now be obvious – it is an ideal magnification range for my use. A visit to their website: https://www.tractoptics.com/about will provide most of the information you need to know about their company and product lines. However, here is a brief summary: The company was founded in 2015 by Jon LaCorte and Jon Addis both of whom have their roots in the sport optics giant – Nikon. With their knowledge of the industry and experience working with Nikon they realized there was a market that many manufacturers were missing and decided to start their own company and offer a “direct to consumer” pricing model. What is “direct to consumer” you may ask? Basically, it is a manufacturing model that cuts out the “middle man” of the dealer, thus allowing the manufacturer to sell direct to the consumer at a better price point than they could if they had to use a dealer network and pay for dealer margins. Obviously, dealers don’t like this, but the consumer does. One other recent startup company who is also using this pricing model is Revic with their PMR428. 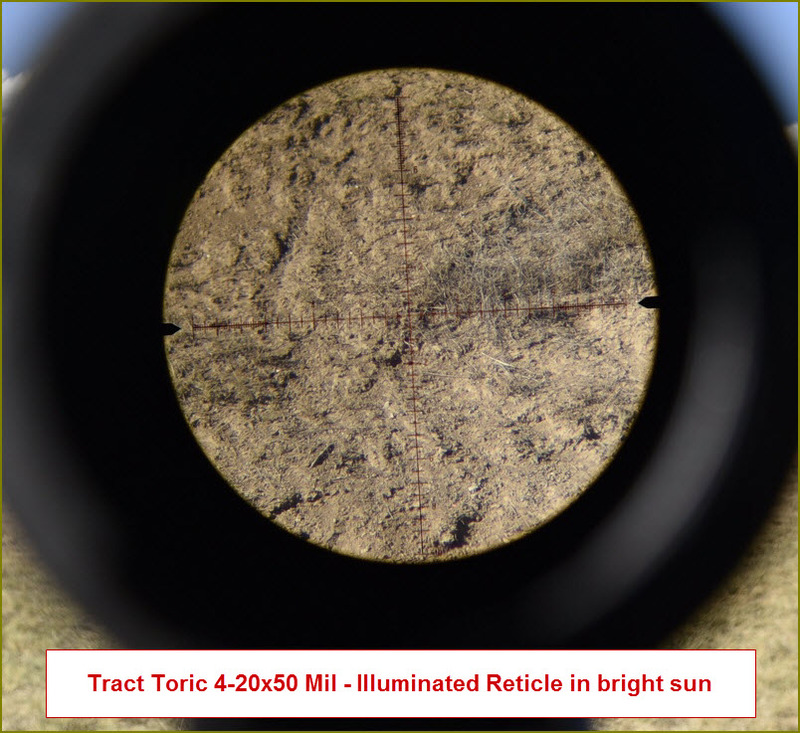 The Toric is made in Japan by the same manufacturer who is known to put out other high quality optics, but one of the unique features of the Toric is that they are using German Schott HT (High Transmission) glass. Given the specs, one might think this scope would easily push the $2000 price point or higher; however, due to the direct to consumer pricing the scope currently sells for a little over $1100 direct from Tract. 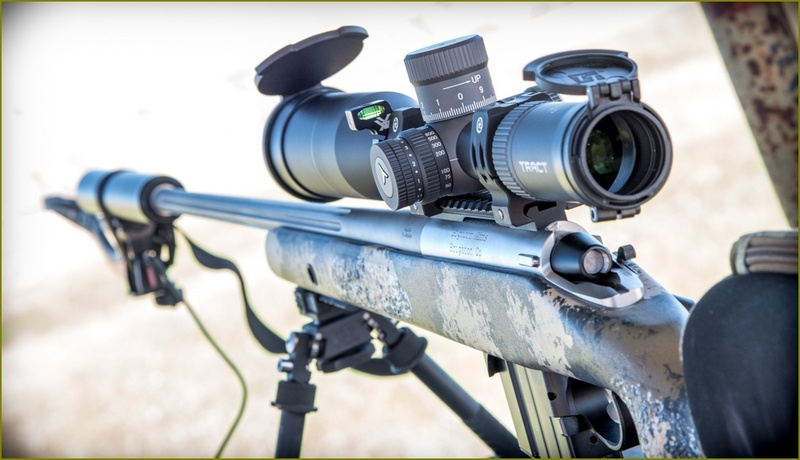 The new Tract Toric 4-20×50 FFP scope seems to be a match made in heaven with Japanese manufacture and Schott HT glass, read on to see if this scope lives up to what the specs promise. Please understand this is a “subjective” review as anything that involves the human eye as an instrument for measurement should be classified as “subjective”. Asking someone “what is your favorite scope” or “who has the best glass” is almost akin to asking “what is the best color”, we can all give our opinions but at the end of the day, it is still our opinion and often times those opinions are further jaded by bias and we all have our bias’s whether we admit it or not. 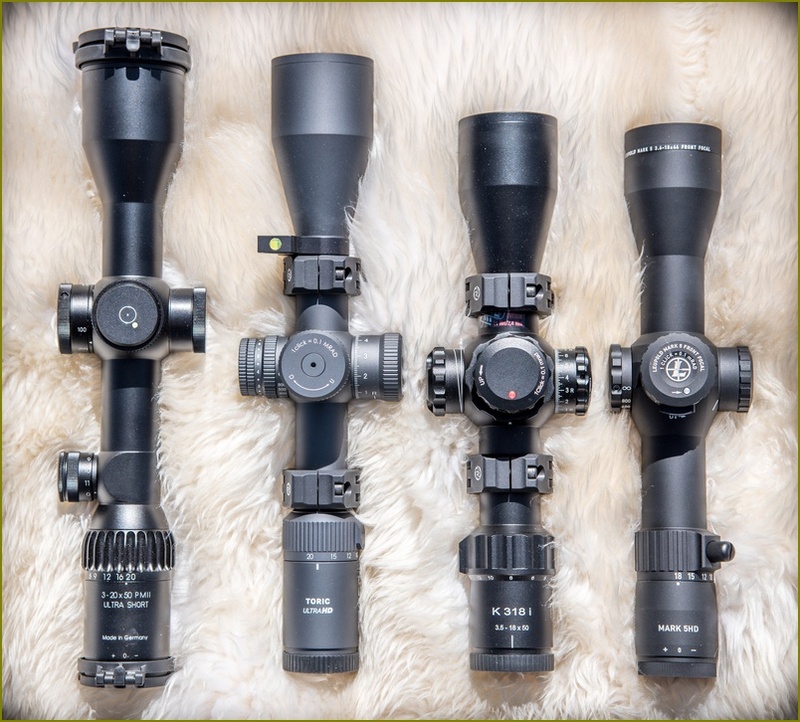 I have been reviewing high end scopes since 2013 and am no stranger to what would be considered tier one, alpha and elite scopes, so it is with this knowledge and experience that I make an effort to give a fair and honest review. Understand I am not a brand loyalist (someone who is committed to only using and promoting one brand), I look for the tools that will better serve me in my sport and if one brand makes a better tool then I don’t have a problem investigating the viability of that tool for my own personal use. I am not paid by any manufacturer to do these reviews, I do them out of my own pursuit for an optic that will fit my needs and enjoy sharing my findings as a benefit to the sport optics community. One final thought, we typically do not review multiple copies of the same scope and there can be sample variance from the same manufacturer so keep in mind this review focuses on one copy of this scope. Over the past few years the conversations on the forums have shifted somewhat whenever the question is asked “what scope should I get?”. Of late, you can often find someone (myself included) recommending the poster consider the reticle first and then choose the scope. This is a testament to both how reticles have changed as well as their importance in long range shooting and how good the scopes have improved regarding reliability and optical performance. The new “craze” of late seems to be the .2 mil hash Christmas tree style reticles like the Kahles SKMR3, Minox MR4, Sig Sauer DEV-L, Vortex EBR-7B to name a few. 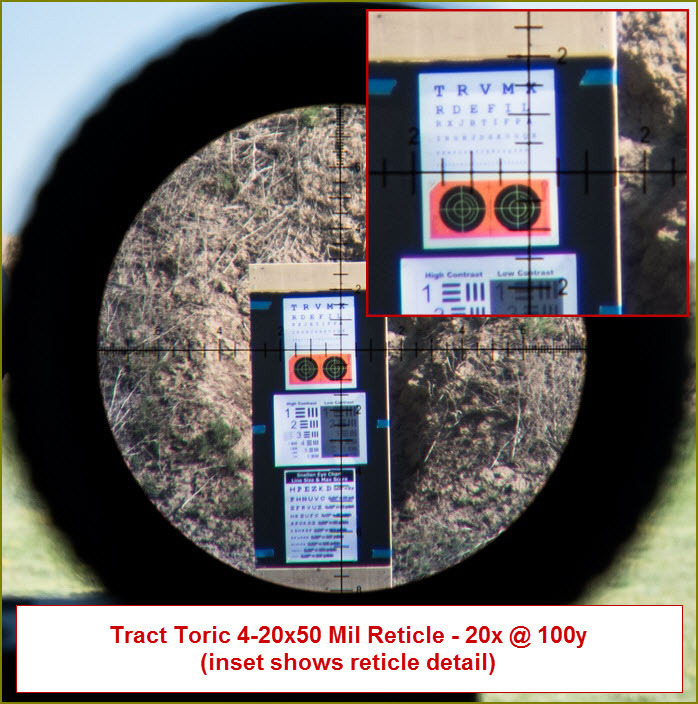 Unfortunately, Tract doesn’t have any design like this (though I am trying to convince them to consider it) and only offers a 0.5 mil hash reticle; however, if a plain mil hash reticle floats your boat then the Toric has you covered. I should note that Tract also offers an MOA reticle for those who prefer MOA over MRAD. Image disclaimer, the below through the scope images are to give an idea for how the reticle looks only, please do not use through the scope images as an indication of IQ, the image is always sharper to the naked eye than it is for a camera due to lens, focus, position, vibration, etc. Ignore the blurry reticle image below, that was my fault, the IQ was crystal clear at 4x and the reticle easily usable. 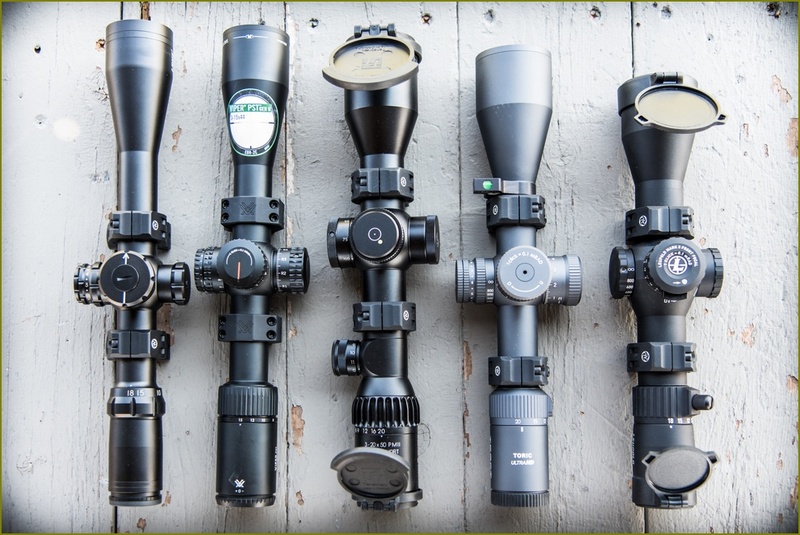 Illumination is almost standard on every modern FFP scope made with few exceptions (ahem Leupold! ), but getting illumination “right” so it does not bleed in low light, but can also be dialed bright enough to be used during bright sunlight can be difficult to accomplish. During my testing I found the Tract Toric’s daylight illumination to be one of the best I’ve seen to date even among tier one optics, being very usable even in bright sunlit situations, keep in mind we’re not talking red dot bright here, but bright enough to see the red stadia lines. Low light illumination was nicely balanced with no discernible bleed. The Toric has an on/off setting between each illumination click. Illumination was brighter to the naked eye than the image shows below. Another very subjective opinion is turret feel and it seems that no two manufacturers have the same feel of turrets, nor does it seem that many can agree on “what is the best feel”, so if you prefer a heavy thunk, a light tick or a high pitched ting when you move between mils, this is going to have to be something that you experience yourself. Personally, I do not get too caught up in turret “feel” or sound, what matters more (to me) is whether I can accurately and quickly spin my turrets to the position I need for the shot, and I’ve found I can do that with relative ease with most manufacturers turrets these days. That being said, I can say the Tract Toric has decent turrets, they are a bit on the “large” side but the benefit of that is cold weather handling with gloves will be very easy to manipulate the turret. 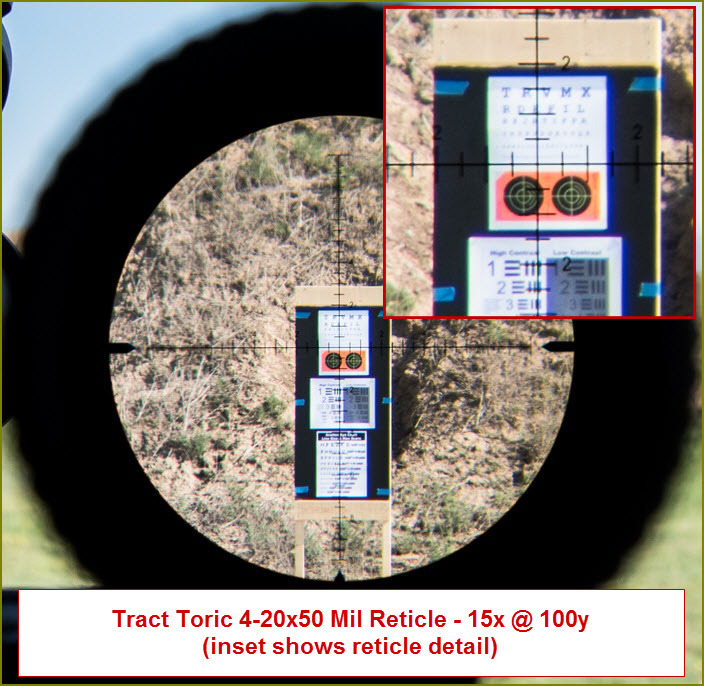 The Toric utilizes a standard 10 mil per rev turret and offers 20 mil of total travel which with today’s modern cartridges like 6.5 Creedmoor will be more than enough to get you well beyond 1000 yards should the need arise. One of my favorite features of the Toric’s turrets is the locking mechanism, when in their “natural” closed state, there is no chance the turrets will be bumped to a different setting, you have to lift both the elevation and the windage turret in order to adjust and the tension to do this is light enough to easily make the change with bare hands or with gloves but providing enough resistance they won’t accidentally unlock. Tract also provides a unique zero stop mechanism that can be inserted into the turret housing. I will say this, some manufacturers offer a “toolless” design that allows you to reset zero but the Toric requires the use of a 2.5mm Allen wrench to unscrew the cap, as a future enhancement I’d love to see Tract offer a toolless alternative so the turrets are a bit more field friendly, because if you forget that Allen wrench and find yourself wanting to make adjustments in the field, you’re out of luck. When the turret is unlocked there is a slight wiggle before the turret will click to the next .1 mil mark, but not enough to throw off dialing your solution. “Turret purists”, as I call them, may have an issue with the sound and feel of the Toric, but for the price I would say only the Vortex PST II has a better “feel”. I took the scope out to my local 1000y range the other day and I felt the scope tracked better than I can shoot, when I did my part I rang steel from 375 out to 1000 yards, the most impressive shot of the day came on a cold bore after eating lunch – got into position (prone), aimed at the 1000 yard 10” plate, check wind, check level, breath, squeeze and a couple seconds later the report of lead on steel. Outside of some anomalies the majority of $1k+ scopes manufactured today have very good tracking, if your scope exhibits any anomalies (e.g. does not track) I recommend that you send it back to the manufacturer and request they fix it, any $1k+ scope manufactured today should track true, if it does not then it is a manufacturer’s defect and should be repaired. I highly recommend you perform your own box test (https://www.snipershide.com/snipers-hide-scope-calibration/) to verify tracking after properly mounting your scope. Smooth parallax that goes down to 25y, ample mag ring resistance, locking elevation and windage all make for one fine package in this short body scope – I say this because the Toric is only 13.7” long, that’s just 1/10” of an inch longer than the Schmidt & Bender Ultra Short 3-20. The only downside to the Toric’s design is its weight, at 34oz this is one of the heaviest 30mm scopes out, a full 3oz heavier than the Burris XTR II 4-20×50 which boasts a 34mm tube and 7 more mils of travel, but it still falls under my threshold for tactical/hunting scopes which for me is at 35oz. The Toric does come with pretty much useless front and rear caps, they are small plastic covers that fall off easily, if Tract added a couple bungie cords to make them bikini caps that would have been much better, the saving grace here is that Tract offers some very nice Tenebraex caps at a reasonable price as an option. One last thing to mention is the Toric only comes in one color and it’s not traditional rifle scope black, it’s actually a gray color, but dark enough that it doesn’t look odd sitting atop most rifles. There are some terms that are thrown around in the community that may have different meaning to different people, one of the most misunderstood in this regard is eyebox, which is most often confused with the spec for eye relief and while having long eye relief can be a good thing it does not define how good of an eyebox a particular scope has; I have seen scopes with long eye relief that have a really poor eyebox and scopes with shorter eye relief that have a forgiving eyebox. So, let me give my definition for eyebox which will help you understand what I’m looking for – put simply, eyebox is the ability to be able to quickly obtain a clear sight picture when getting behind a scope. Something else that can affect eyebox performance is where you mount the scope and your cheekweld, if you mount too far forward or too far back you will experience a “tunneled” sight picture and if your scope is high or low and your cheeckpiece is not in the right position then once again you’re going to have a distorted sight picture making for a difficult eyebox. So rule number one is getting the proper mount of your scope on your rifle, my recommended method for getting the proper position is to put your scope at its maximum magnification setting (this is where most scopes have their worst eyebox performance) and then place the scope in the rings without fully tightening, now, close your eyes and bring the rifle up to your natural hold, open your eyes, do you have a clear sight picture? 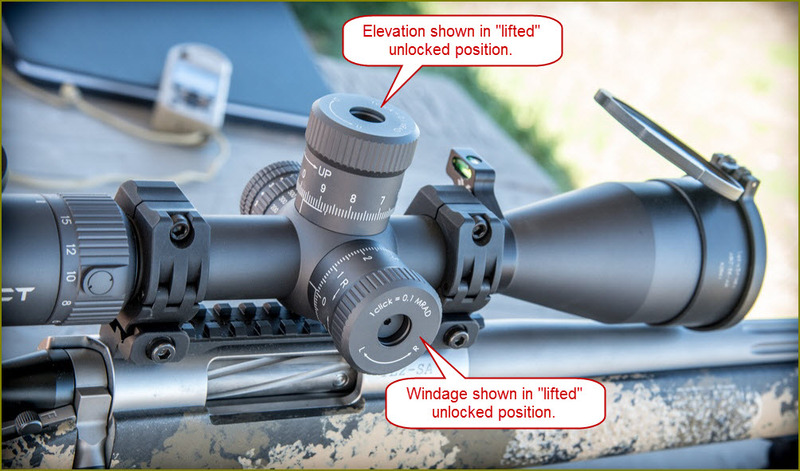 If you have to wiggle your head or adjust your position slightly, then you do not have the proper mounting position, move your scope forward or back and repeat the process. You may also need to adjust your cheekpiece, if you have an adjustable one that’s pretty simple (if you do not then I recommend you get one or look into a good stock pack like the ones from Triad Tactical). The goal is that every time you bring the scope up to your natural hold, the sight picture is spot on, if you do this then even scopes with a very finicky eyebox’s should perform decently for you. With that winded explanation in mind, how does the Toric perform in regard to eyebox – for an ultra short design I would say it performs very well, keeping in mind that designing Ultra Short scopes and getting them to perform alongside their regular length peers is not an easy task which is usually reflected in the price of the scope; however, more recent trends have shown some newer designs like the Toric which do not break the bank but still offer very good eyebox performance and my testing showed again and again that the Toric was very easy to get behind. Probably the most subjective test there is of a scope is identifying optical quality; there are so many factors that go into a good optical formula that it’s hard to quantify, which is why there is no spec by any manufacturer that defines the quality of the image/glass, for that you have to rely on either looking through the scope in the poor lighting of a store or if you’re lucky, find a store that will allow you to take multiple scopes outside on a stable mount and look through them side by side in good lighting and then go back right after sunset and look through them again, because I have found that many scopes perform well in good lighting conditions, but when the light gets low, you begin to see a separation of quality. Things I look for in a scope for optical quality are resolution, color, contrast, control of CA and low light performance. If a scope performs well in all these areas then I consider it to have excellent IQ (Image Quality), if it suffers in one area but excels at others I am usually okay with that, but if it suffers in two or more than it really needs to be a niche scope for me to want to keep it and/or recommend it. I determine optical quality by first setting up the scope properly for the diopter and parallax and then conduct a combination of tests both near and far, as well as perform an analysis at 100 yards using a modified Snellen eye chart as well as a High/Low Contrast target. However, keep in mind that atmospheric conditions can affect the outcome of any tests not performed in controlled environments, I do not have access to these environments, so I do the best I can with the conditions nature provides. I also try to compare the review scope(s) to another that I am confident in its optical performance as well as a few other scopes of similar design to get an idea of overall performance. 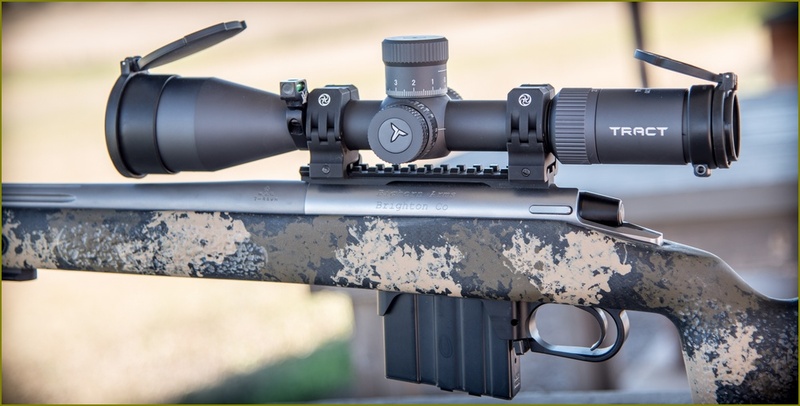 One final note, most of the time I only review one scope and there can be sample variation so if you hear of everyone else raving about the quality of their scopes (same model) and yours just does not perform, it may be wise to send your scope in to the manufacturer to have it tested. 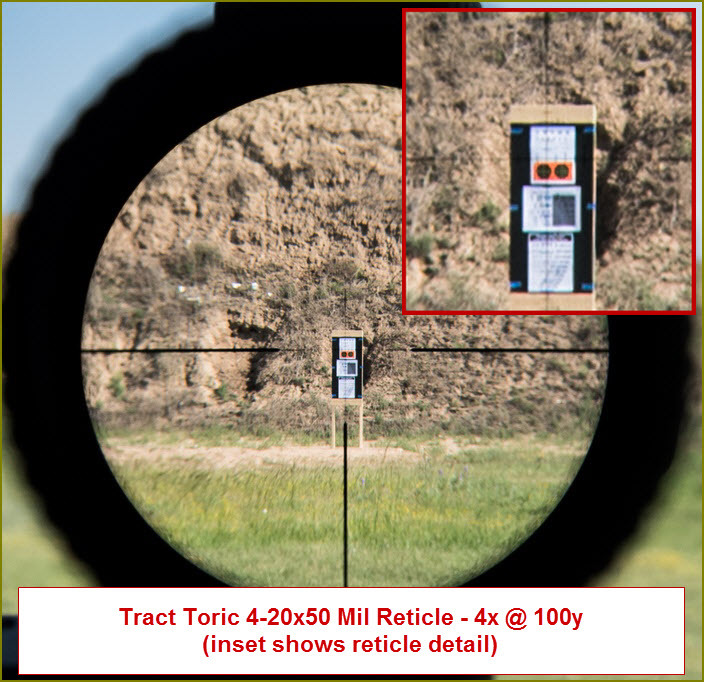 For this review the Tract Toric 4-20×50 FFP was put up against a Bushnell LRHS 4.5-18×44, a Vortex PST II 3-15×44, a Vortex PST II 5-25×50, a Burris XTR II 4-20×50 and a Sig Sauer Tango4 4-16×44. 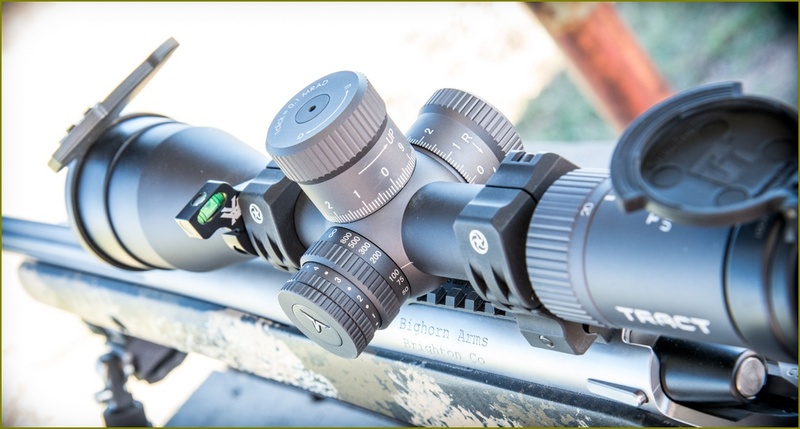 Resolution – there are few scopes in the Toric’s price range that one could consider punches above its weight class, one of those scopes is the Bushnell LRHS/LRTS which has a phenomenal track record for having excellent optical quality rivaling closely with scopes that cost twice as much. I can confidently say the resolution of the Toric was superb for its price, easily matching the LRHS on hand and maybe even performing slightly better in certain situations, the fact that Tract was able to get this quality from a short body and 5x erector vs. the LRHS’s long body and 4x erector is pretty amazing. Looking at detail like blades of grass, grain in wood, rocks and dirt revealed the Toric was truly a best in class in IQ, this was also apparent in the Snellen eye chart test. Contrast – Contrast and resolution kind of go hand in hand; however, contrast can be another term that might be misunderstood so let me define – the ability of the scope to differentiate between smaller and smaller details of more and more nearly similar tonal value (this was pulled, in part, from an excellent article on Luminous-Landscape https://luminous-landscape.com/understanding-lens-contrast/). Using the contrast chart and determining detail in distant objects you begin to get a feel for “how much” detail a scope provides. The Toric once again proved to be a peer of the stellar Bushnell LRHS with overall contrast, the Bushnell may have had a slight edge in high contrast while both were equally superb in low contrast testing with the Toric maybe having a slight advantage. Color – in recent years I have found more and more scopes getting better at color, whether improvements in multi-coating or better manufacturing techniques of the glass itself I’m not certain but it is nice to see this improvement. CA – another hotly debated topic is chromatic aberration which is typically seen at the edges between high and low contrast objects in what is termed as fringing and usually comes in a band of color along the green/yellow and magenta/purple spectrum, some are greatly annoyed by this optical anomaly while others insist they cannot see it, one thing to know is it has nothing to do with your ability to hit a target; however, Ilya has mentioned “It is not terribly critical for aiming, but it is important for observation and image fidelity during twilight before your eye transitions into scotopic vision.” This is one area where the Toric struggled a bit against some of its newer peers, Vortex has done the best job with their new PST II line IMO. CA can rear its ugly head even with some tier one optics, but seeing heavy CA in a $3k scope vs a $1k scope is very different and for its price point I found the Toric’s CA to be acceptable. Low Light – My testing takes into account all the above but in low light settings, usually after the sun sets and into where it almost gets too dark to see. In these conditions I like to set my scopes at 12x to take advantage of the exit pupil with fading light while still providing enough magnification to stress the limits of the scope (and my eyes). The amazing thing here is that all scopes performed admirably well in low light, contrast this from scopes I reviewed 5 years ago and the “budget” scopes then just couldn’t cut it while today’s scopes seem to be built for low light performance. I had to look long and hard at minute details in fading light to truly discern which scopes performed better, when not side by side it would be very difficult indeed to determine which, if any, performed better. The larger objective scopes still have a slight advantage over the smaller objective designs, but the difference is getting quite small with newer designs. The Toric performed extremely well in low light testing. The fit and finish of this scope is truly impressive for it’s price point, I am really liking the overall design and don’t mind the matte gray finish as much as I thought I would, the addition of the sunshade and optional Tenebraex caps are nice touches to complete the package. 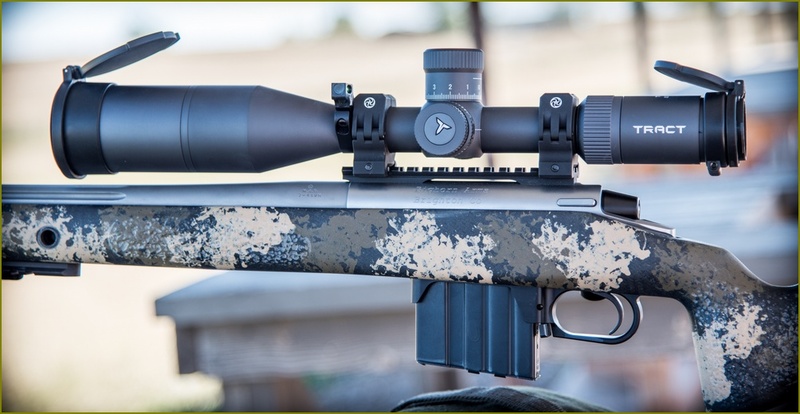 The short design of the Tract Toric 4-20×50 FFP makes this an ideal scope for many rigs from bolt action rifles to AR platforms as well as covert style rigs. Are there better scopes, yes, but none of those scopes offer the same performance and size at the Toric’s price. Sure, it has a couple issues with CA and weight but with it being as short as it is and having the excellent IQ it has, this will more than make up for its shortcomings for many shooters. I would like to see Tract come out with a .2 mil Christmas tree style reticle as well as a possible future enhancement offering lower profile turrets with a toolless zero design. For optical purists looking for the best glass at an “affordable” price this scope deserves your attention; to get a “better” scope you’re going to have to fork over 2x and in if you want a quality ultra short it’ll cost you 3x as much. 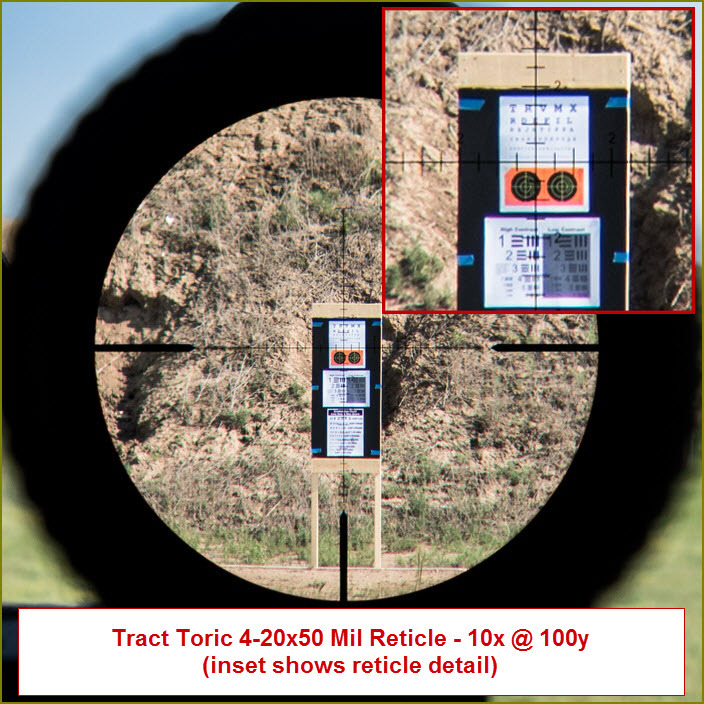 The Tract Toric is one of the best scopes available at its price and higher. I highly recommended this optic for those looking for a great scope in the $800 – $2000 class. At home on an AR platform, this is my 14.5″ bbl with pinned brake for reference. While not part of my initial review, I did have a Leupold Mark 5HD 3.6-18×44, a Kahles K318i 3.5-18×50 and a Schmidt & Bender Ultra Short 3-20×50 on hand. At over $3k the comparison to the $1k Toric seems a bit unfair with the Kahles and Schmidt, but both offer a similar magnification range and short design with the Kahles coming in a full 1.4” shorter and the Schmidt Ultra Short coming in at only 1/10” shorter. Resolution and contrast are close between these scopes which is a testament to the quality the Japanese manufacturer’s continue to put out, that being said the Kahles is an even shorter design and the Schmidt has a greater magnification range while both handle CA better, the Kahles and Schmidt also have “better” turrets in regard to overall click feel while the Kahles boasts one of the best Christmas tree reticles in the business with the SKMR3, but all this comes at a cost, at 3x as much as the Toric you have to ask yourself “is it really worth it?” and for those who simply can’t afford tier 1 optics, the Toric is a fantastic compromise. You might be wondering why the Leupold Mark 5 isn’t mentioned above and that is because I do not consider it to be a tier 1 optic, impressive for such a short package at just over 12″ but optically it struggles, the Mark 5 had worse CA in my testing and at half the price the Toric easily bested the Mark 5 optically, that being said the Mark 5 has my favorite turrets to date. Bill Meyer has been around firearms since he was a young boy and enjoys shooting for fun as well as hiking around the Rocky Mountains in search of big game. Bill was a professional wedding and portrait photographer for over 17 years which gave him his obsession for good “glass” and translates into his pursuit for the perfect scope (which he’ll readily tell you does not exist). Bill served in the US Army in the late 80’s and in 2012 he caught the long range bug and began having custom precision rifles built, as well as building some AR platform rifles himself. Bill’s passion for shooting has driven him to find gear which will best serve his shooting style and he enjoys sharing the knowledge he picks up along the way with other sportsman. Excellent review! I picked one of these up this past spring. I initially had the PST II 3-15 and wasn’t quite pleased with the optical quality (my background is in LPVO like the K16i, Razor G2, VX-6HD, for reference). After many hours of research I decided to give the Tract a change. My only complaints were the ones you mentioned (CA and weight), but for the price (got it even cheaper with military discount) it’s extremely hard to beat. It’s sitting on top of my custom built AR-10 (6.5CM) in an ARC mount.